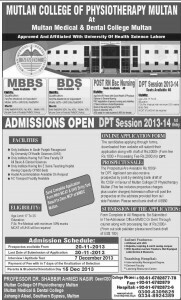 Bahauddin Zakariya University (BZU) Multan Admission 2013 Bahauddin Zakariya University (BZU) Multan Admission 2013 for MS / M.PHil / M.Sc. (Hons.) Pharmacy (Pharmaceutical Chemistry, Pharmacognosy, Pharmacology, Pharmaceutics), Food Science & Technology, Biochemistry. 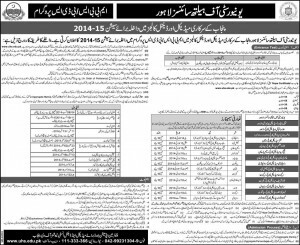 Multan College of Physiotherapy Multan Admission Notice 2013 Multan College of Physiotherapy Multan Admission Notice 2013 for Doctor Of Physiotherapy (DPT). Multan: Multan Medical & Dental College MMDC) admission Notice 2013 for Bachelor of Medicine, Bachelor of Surgery (MBBS), Bachelor of Dental Surgery (BDS), Doctor of Physical Therapy (DPT), Post RN B.Sc. Nursing.